Scottish porridge oats with apple & cinnamon. Wholesome & hearty. 9g protein per pot. Perfect porridge in 3 mins. Just add hot water. Suitable for vegetarians. 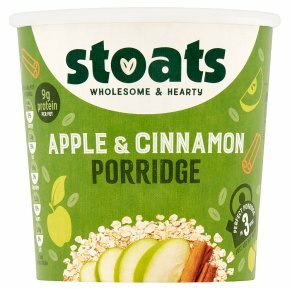 Treat yourself to our delicious blend of premium Scottish oats and sweet apples, with a hint of spicy cinnamon - A perfect source of protein, fibre and slow release energy to kick-start your day the Stoats way! Shake pot then peel back lid Add boiling water to fill line (approximately 160ml) Stir well Leave to stand for 3 minutes Stir well again Add more water if required to adjust the consistency of the porridge. CAUTION: HOT PRODUCT AND POT.